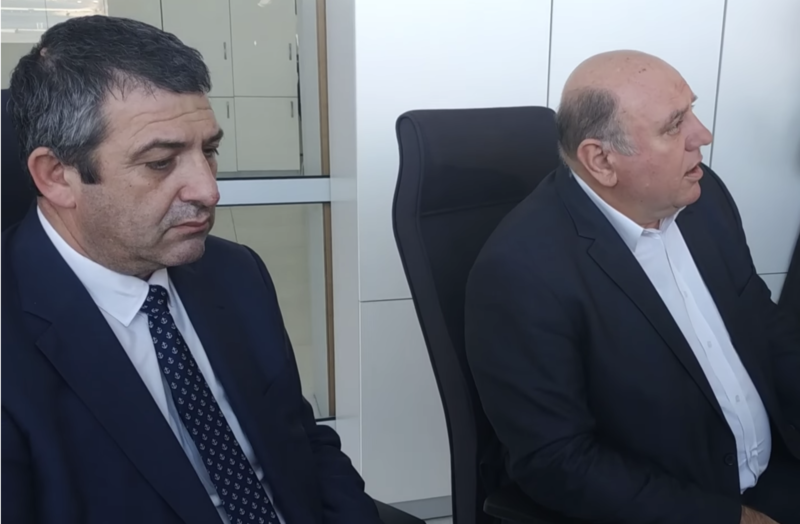 In just 24 hours, the Director of the Main Directorate Border Police Svetlan Kichikov changed his story about the actions of the police from the border checkpoint at the Burgas Port in connection with the incident with the tanker BADR. On Tuesday, January 15, 2019, he claimed that no violations had been committed during the investiture of the new owner of the tanker BDIN/BADR. The next day, at a press conference, he was already saying that there had never been an investiture, the private law enforcement officer (PLEA) had not been in attendance, the border guard unit had followed the procedures for performing initial border control and the internal probe into the case had not revealed any violations. This frank and documented lie, however, is only part of the dirty laundry that the Ministry of Interior (MoI) is hiding in this scandal. In its official position, the Libyan company, owner of the tanker, fully stands behind the notary-certified testimony of the Captain and the written testimony of the crew about the presence and the use of force by border police officers and guards of the unlicensed security company “Bashev Team & Security”, as reported by Bivol as early as December 31, 2018. But besides Kichikov’s lie, which is documented, the other actions and statements of the MoI, are also perplexing and rise suspicions that more outrages are being concealed. Some of the violations are simply detected by a more careful reading of the official statements and comparing them with laws and instructions. On the last day of 2018, Bivol turned to the Ministry of Interior (MoI) for a comment. They replied that they did not see anything wrong with what happened and stated for the record that the border police had been simply helping the new owners entirely within the law. In its answers to our questions, the MoI press office explains that on the basis of a letter from December 21, 2018 by the ship agent “Euro agent” and the Maritime Administration Directorate to the head of the port in connection with the replacement of the crew, a team has been tasked with assistance and execution at an outbound border inspection of a tanker under a Panamanian flag, named BDIN and located in the harbor of the Burgas port. It further notes that this has been a standard procedure, performed in accordance with the border checks’ instruction and the Main Directorate Border Police have fulfilled their obligations under these instructions. Art. 64. (1) Border inspections of the crews of vessels shall be carried out depending on the assessment of the risks related to international and national security, illegal migration, public health threat, based on previously submitted crew lists. (2) A minimum border check may be carried out on the basis of prior information about the crew of the vessel. (3) A comprehensive border check shall be carried out on board of the vessel, encompassing the entire crew and may include a check of the ship’s premises. (4) The inspections under para. 3 of a vessel assessed under a risk analysis as highly risky shall be carried out by a minimum of two border guards. If necessary, officials from other services responsible for border control may also be involved in the checks. Art. 71. (1) The shipping agent shall notify the relevant border checkpoint in writing of any changes to the crew lists. After the sanction of the head of the border checkpoint, the change is reflected in the ship’s crew list. (2) When repatriating/listing a member of the crew for whom a visa is required, the shipping agent shall submit to the head of the border checkpoint the documents for issuing a visa at the border. (3) After issuing the visa, the border checkpoint that issued the visa notifies the border checkpoint from where the person will leave. However, Art. 71 refers to the transit, embarkation or repatriation of persons from the crew of a merchant ship through the territory of the Republic of Bulgaria and not to the entry and exit control of a vessel. When the crew of a vessel passes through the border checkpoint of a Port Terminal, they pass through a passport, border and customs check and their entry into and exit from the territory of the Republic of Bulgaria is reflected in the Automated Information System (AIS) Border Control. (4) The minimum border check for an exit border check consists of checking the information from the crew list in the AIS Border Control. Following a risk assessment by the police, the shift supervisor/unit commander may order border checks to be carried out on board of the vessel. The crew list, in a unified international format, and other required declarations shall be provided to the border authority at least 24 hours prior to the entry of a vessel into territorial waters. The documents received are filed in the vessel’s dossier in the documentation of the Main Directorate Border Police. What risks did impose the execution on December 21, 2018 of the full exit border control onboard of BADR/BDIN instead of the minimum one, which is the common practice for a ship that has not been docked at the pier, but has been anchored in the Burgas harbor for more than a year? After the full border control, the ship had been “sealed” for private individuals and service personnel, except for the pilots tasked with the maneuver to remove the ship from the harbor. However, it is recorded in the electronic database that a check under the Paris Memorandum of Understanding on Port State Control was implemented on December 22, 2018 by Maritime Administration-Burgas. Eight deficiencies were detected and the ship was detained for five days until their elimination. It went into international waters on December 27, 2018. Usually, an exit border control is executed a few hours before the pilot boarding. The exact time is determined by the traffic control (VTS), the agent and the command of the ship, while the relevant port authorities and immigration services are notified in time to avoid confusion in the operational timetable. In some force majeure cases, the control is executed 24 hours prior to the pilot boarding, but in this case BADR/BDIN was anchored in the Burgas harbor (which under the law and the United Nations Convention on the Law of the Sea, UNCLOS-82, is in internal waters and not in territorial ones), for another five days after the exit border control was carried out on December 21, 2012. So, when exactly has the exit border control of BADR/BDIN been performed? Have persons boarded it in the period from December 21, 2018 until its release into international waters? “Euro agent” Ltd, as the shipping agent of the new ship owner Bulgargeomin DZZD, has submitted requests for a crew change on December 21, 2018, along with the the necessary documents and information to the Burgas border police for the issuance of a type B transit visa for the crew of the BADR tanker, and has arranged food and accommodations for the crew members and their repatriation by booking and purchasing airline tickets. According to the Maritime Labor Convention, MLC 2006, the ship owner must ensure the repatriation of the crew of their ship and to bear all travel costs to the Port of Engagement or another agreed location. According to MLC 2006, the employer of the BADR is “Libyan NAVIGATOR” -Malta, and it is it that is required to pay compensation to the crew for a terminated contract and to ensure its repatriation through its agent in Port Burgas. Bulgargeomin DZZD is not an employer of the old crew, while the Captain of BADR has obviously had no contact with “Euro agent” Ltd.
On what grounds has a representative of Bulgargeomin DZZD paid a compensation to the BADR crew and organized its repatriation through “Euro agent” in its capacity of ship agent since the company does not appear to be their employer under the international Maritime Labor Convention? How and from where did the ship agent obtain the crew’s personal information for the booking and purchase of hotel rooms and airline tickets, after apparently not having had any contact with the Captain of BADR, with “Libyan NAVIGATOR-Malta” or its authorized representatives in Bulgaria? Was there unauthorized access to these personal data and who provided it to “Euro agent”? Are employees of the Maritime Administration and border police involved in this data leak? Will border police confirm or deny the statements of the Captain and crew about the presence on December 21, 2018, of employees of the unlicensed security company “Bashev Team & Securities”, for which the MoI’s press office admitted that it does not have a license for private security activity, as well as that the employee of the special police task force in the capital Sofia, Alexander Longochev, had been onboard the tanker dressed in the uniform of this same security company. So far, however, the only comment of the MoI on the presence of Alexander Longochev on the tanker in the uniform of a private security guard is there is a probe into the case. Will the MoI impose an administrative penalty on “Bashev Team & Security”, regardless of whether it has any relation to the case of BADR/BDIN and will it launch an investigation into the company’s activities and into who is behind it?